And I was the proverbial person sitting on top of the suitcase trying to jam everything in. First of all, it was beautiful weather here from Friday to Sunday. Like, 65-70 degrees and sunny beautiful. So of course, we were outside all.day.long.all.weekend.long. This is what we do in the Midwest. When the weather is nice, we all run outside and stay outside until it gets not so nice. Because we know it won’t last. Add in a soccer game, weed pulling, a door project, a neighborhood bonfire with 20 + adults and children, a birthday (that would be me!!! ), a mini trip to Wisconsin and a massage (that would be for me!!!! ), it was crazy busy. So busy that we didn’t even have time to frost or eat my birthday cake. So Ellie frosted it this morning and we ate it for breakfast. The houses in our neighborhood primarily have three different color doors: black, white and burgundy. I gotta think that those were the only choices people had when they were building these homes. Or else people just didn’t want to go outside the box in terms of door color. I have seen blue and brown doors sprinkled in here and there but mostly just the above. Of course, I wanted to shake things up a bit. I have stared at the same front door color for eight years and burgundy wasn’t cutting it for me anymore. Plus it had paint scrapes, chips, dings and it was just looking, blah. First off, let me credit Emily Clark for this picture. Pinterest has made it ridiculous to embed a picture anymore. It took me ten precious minutes before I finally gave up. So go to Emily’s blog, she is a designer and has amazing taste. I saw this color and had such a reaction to it immediately, I knew I wanted it in my home. Isn’t it an amazing green?? The color is called “Paradise” by Sherwin Williams. Anyway, I had all this courage left over from painting those doors black that I thought I would try the exterior door. But it was getting cold and I didn’t want to start it until it warmed up again. Yes, folks, that is the first warm day of the year in these parts. Do you see the dings and scrapes? Someone was my shadow that day. And please notice the stocking cap on. The last week of April. So it wasn’t a horrible color or anything, I was just over it. And it really needed to be painted anyway because it was really bad and the front door is the first thing people see when they enter your home. The first step in my plan? Go to my local Sherwin Williams and get a swatch of this lovely color I was intending to paint. I do feel a little guilty going in, asking for the color swatch and then ditching them to buy it cheaper somewhere else. I have a feeling they get this a lot but I still get a tinge of guilt. Which goes away as soon as I realize how much money I save when I buy it at a home improvement center. I then went to Home Depot and worked with the handy fella there in finding me the right paint for this project. I didn’t see his name on his shirt. So we can call him Hayward. For the sake of this post. – I need a paint for the exterior of the front door. – It has a storm door in front of it. – I have kids. Who slam this door, put their hands on this door, kick soccer balls that randomly fly and hit this front door, that take their hands with a mixture of bubbles and chalk and write love notes to us on this door. -I don’t love to paint so am looking for something I don’t have to paint more than two coats of. It just came into the stores on Monday. And I came in on Friday. By the way, I am not being paid by HD or Behr. I should be but I am sadly not. It was 20 bucks for this small can. BUT I did not have to purchase primer so that with the paint would have cost me 20 dollars. This paint is dirt resistant, stain resistant and blocks UV rays. So basically, the superhero of exterior paints. Then I bought these tools to help me with my job as per the suggestion of Hayward. A small roller (for most of the door) and a small paintbrush (for around the doorknob, deadbolt and the panels of the door). Then after some taping, I got started! I should say “we” got started. My 13-year-old just got off the bus when I was starting and wanted to help. 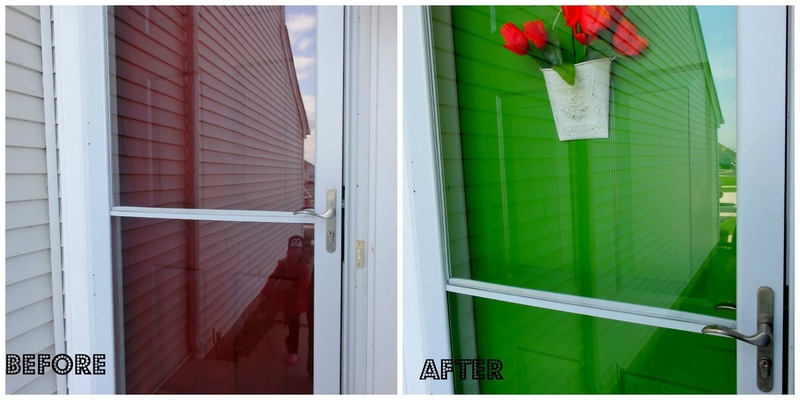 It should also be noted that said 13-year-old BEGGED me not to paint the front door green. And I quote, “Ewww Mom that is gonna be ugly”. Then after a coat, she loved it. She was all, “wow that looks so cool“. Now you are on my side. By the way, I did some painting too. She just got all the glory. When it first went on, it looked a little more Kermit green. And less interior decorator green. And when I took pictures on my phone to show family and friends, it looked more St Patrick’s Day than Summer Day. In fact, one of my blogger friends likened it to a pub in Chicago. That I guess has a green door. I likened it to an Irish pub. Which wouldn’t be at all inappropriate? The husband is ALL Irish. And our house is full of merriment. Maybe more there than here. So I went to bed that night knowing I liked it but that it definitely needed a second coat of paint. And was also a little concerned a drunken Irishman would stumble into my foyer. It was finally starting to look like the Pinterest inspiration!! There is that pretty sun we had all weekend shining on my brand new door!! It’s looking all spring up in here?? My daughter said, “wow, our house looks trendy“. I still don’t know how I feel about that comment. The bar is on the left!!! Just another Irish pub joke. It makes our plain old off-white house pop. I had so many comments on this door just in the past 48 hours. Even guys were making comments about the door and they usually don’t even notice stuff like that. I love how it looks in the mirror in the living room! Look at my spring-y door!!!! Total cost to makeover my door? That includes the brushes and the paint. Not a bad investment, I would say. Here is the before and after side by side. Small roller for smooth surfaces and a small-medium regular brush. The roller cost four dollars and some change; the brush cost about $5.00. Tip- For a drop cloth I used a ripped up trash bag. Did the trick and just threw it away when I was done! Also, make sure you use some sort of tray for your paint. Total time for this project- I started the first coat while the youngest was at school and it took about 30 minutes to coat the entire door with the first coat. I finished the next morning and took about 20 minutes for the second coat. So less than an hour to transform the front door! Whew! Off to get a drink at the bar!! Love the new color! So much more 2013. =) I'm on the 'paint my door' bandwagon too but I keep changing my mind about the color. I'll commit one of these days though! Until then, I'll live vicariously though your pretty green door. The fact that you had birthday cake for breakfast makes me love you even more. I love your door and your irish pub references. And I'll take a margarita, with salt. Thanks. Cake and pizza for breakfast are two of my guilty pleasures! !I will buy you that rita the next time we go out! I love your door! That green is so forcefully joyful. And Happy Birthday!!!!! Aww thank you so much, Hannah! It is metal, great question! This is SO SO SO perfect and beautiful and cheery! You are amazing. AMAZING. I need cheer, darnit. Maybe i'll paint one of my kids green. Painting the children!! Why didnt I think of that?? Brilliant!! I LOVE your door! I have told my hubby many many times about you and your blog. Rest assured that I will be talking about this at lunch today! You did a fabulous job with picking the color and I really appreciate the info on the new Behr paint. I LOVE THIS!!! You are one ballsy chic to paint your door that color. It rocks! PS – How about green is the color of MONEY and you are manifesting it in to your home??? Loving it! So much better than "boring Burgundy"! Oh – and I thought I was the only one that couldn't stand cords showing. Drives me nuts. Oh, I love the door! Green is my favorite color, after all! I door is still the primed white – they way we purchased it. 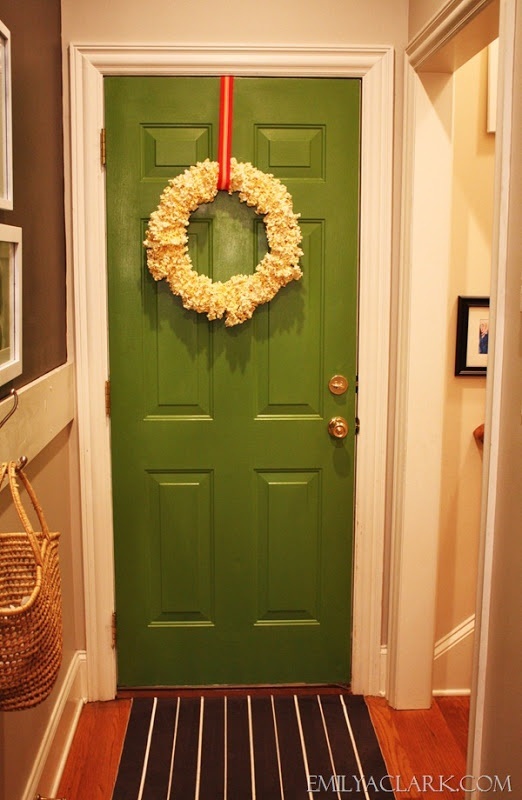 Unsure if what color to paint it…I may have to show the hubs your beautiful green door an do something similar. And, birthday cake for breakfast? Sounds amazing (and, HAPPY BIRTHDAY!). irish pub or trendy, i love it! great choice. I'm gonna need a quote. Will send you a picture of my door this week. I love green! You are right, it looks great in the reflection in the mirror. I've been going back & forth between green & blue for my front door. I love Emily's green door too! Wow I love the color it pops! You did a great job on this door! I am a new follower from southern charm! I would love for you to check out my blog and hopefully you will want to follow me back! Happy weekend, Nicole! Great color choice! The green really gives a pop of Spring. 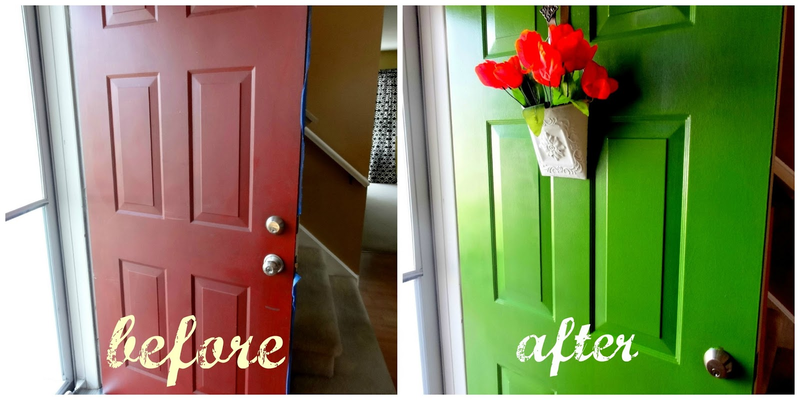 That IS a hard one but a pop of color on a front door is the new neutral, if that makes any sense. Maybe a different shade of yellow, like a mustard? Let me know what you decide as I am now itching to paint MY front door again.